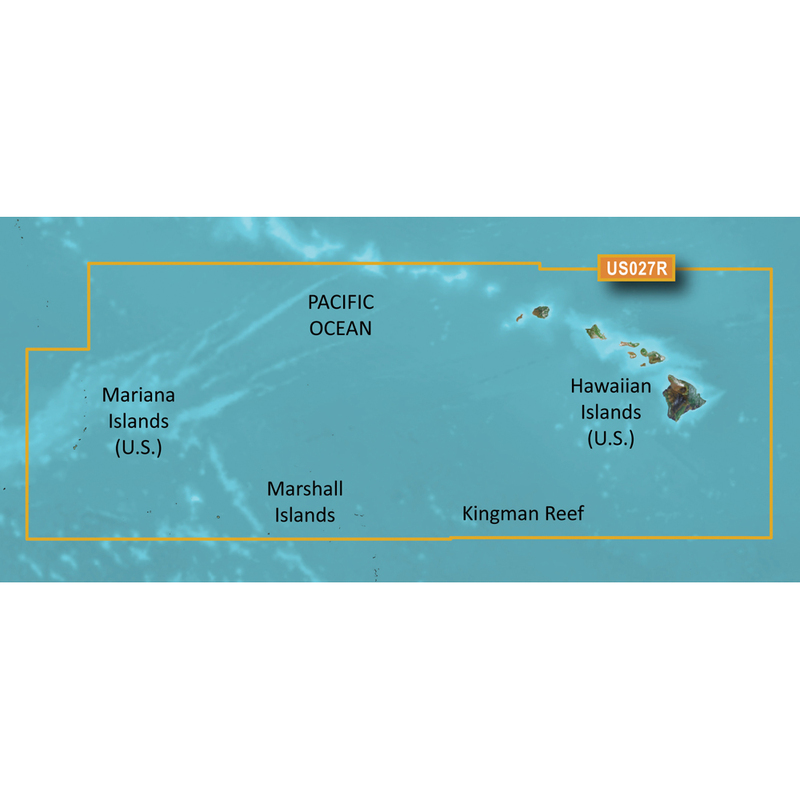 Coverage of the Pacific Ocean from the Hawaiian to Mariana Islands. Includes coverage of Guam, Midway, and Johnston Atoll. General coverage of Palmyra Atoll and the Marshall Islands also included. Experience unparalleled coverage and brilliant detail on the water. BlueChart g3 Vision coastal charts provide industry-leading coverage, clarity and detail with integrated Garmin and Navionics data, Auto Guidance technology and high-resolution relief shading.. The Auto Guidance feature¹ uses your desired depth and overhead clearance to calculate a route and a suggested path to follow. High-resolution relief shading combines color and shadow to give you an easy-to-interpret, clearer view of bottom structure than contour lines alone. The closer the contour lines, the more accurate the depiction of the bottom structure for improved fishing charts and navigation in swamps, canals and marinas. If you prefer your display to have the look of paper charts, NOAA raster cartography2 is available as a free downloadable feature via the ActiveCaptain® app. This feature provides up to 10 depth ranges, enabling you to view your target depth at a glance. This feature allows you to use shading to designate the shallow water depths you need to avoid. These detailed images of ports, marinas, bridges and navigational landmarks help provide you with superior situational awareness. MarinerEye and FishEye views provide additional perspective both above and below the water line.